Chamonix is one of the French Alps' flagship resorts, one of its busiest hubs and has some of the best, most challenging skiing too. An expert's paradise, with extensive lift-served off-piste runs including the iconic Vallée Blanche, and some serious high altitude runs at Grands Montets and Brévent. At busy times, you can barely move around central Chamonix for all of the huge off-piste skis, serious looking backpacks and rugged mountain guides. Chamonix can work for beginners and intermediates too though, you just need to know where to look. Le Tour and Les Houches both offer gentle terrain and tree-lined pistes where you can shelter if the weather closes in. However, you've got to understand Chamonix as it won't suit everyone. It's split into 5 distinct and very seperate ski areas and you will need to use the Chamonix Valley transport system to do the whole thing justice. Le Tour and Les Houches for example are at opposite ends of the valley, nearly 20km apart. The bus and train services are excellent, but having to travel between ski areas isn't every beginner's cup of tea. The more adventurous will also find that Courmayeur in Italy and even Verbier in Switzerland are accessible for a day trip from Chamonix. 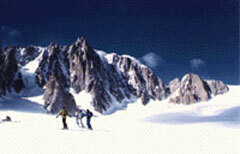 Chamonix is one of the finest ski resorts in the French Alps and offers something for everyone. You must be prepared to put in the effort to get the most out of Chamonix, but if you are then you will find a wealth of Alpine experiences that will have you coming back for years to come. 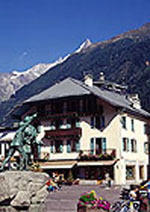 Chamonix is a large, bustling town in its own right. Totally different to the purpose built resorts on offer elsewhere in the region. It has a large year-round population and the resort amenities are like no other. The large pedestrianized centre offers a huge choice of shops, bar restuarants and nightclubs. There's even a casino and the range of off-slope activities can seem endless. If you have non-skiers in your group then Chamonix should be at the top of your list as it can keep everyone entertained. To top it off, Chamonix is located only 1 hour from Geneva, making it one of the shortest transfers. 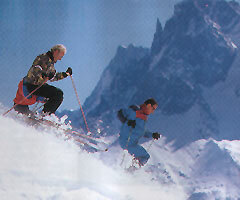 Uniquely, Chamonix manages to combine this lighting fast transfer with true high-altitude and glacier skiing. Other resorts with similar transfer times (Morzine, for example) can't offer the same high altitude skiing. World famous resort with loads of expert terrain especially off-piste. Excellent extensive nightlife. Spectacular scenery with Mont Blanc and its glaciers looming over the town. A very rare combination of a short transfer (1hr) and high altitude glacier skiing. One day prices depend on which ski area in the vicinity you visit. Higher price is for the Mont Blanc Unlimited area pass (1 day). Six day prices quoted are for Mont Blanc Unlimited pass, option to buy full Mont Blanc region passes at additional cost for six days or more. Family tickets available.